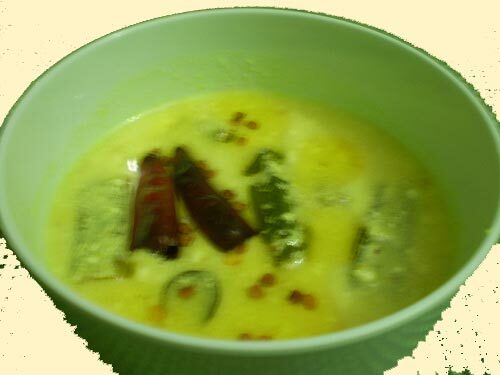 A traditional south indian recipe that tastes well with rice. it is easy to prepare and needs less than 10 minutes cooking on fire.The best way to use left over sour curds. soak coriander seeds, rice, thoor dhal,jeera, red chillies and green chillies in 1/4 cup of water for 1/2 hour. drain water and grind to a paste along with grated coconut, using very little water. heat oil and add mustard seed and curry leaves. add turmeric powder and the paste. fry for a few minutes and add curds and salt. remove from fire when the gravy lathers. do not boil. add coriander leaves for garnish. serve with hot rice and gingelly oil.